Why charter a boat when you can be in charge of your own self-drive fishing adventure in Melbourne out on the famous Mordialloc Bay. Mordialloc has been the home of boat fishing for over 100 years, The Famous Five Hotspots are just 5-15 minutes away by hire boat with a huge variety of fish species including snapper, flathead, salmon, whiting, garfish and many more. Prize snapper up to 10kg are landed every year and Mordialloc is the location people travel to from all over Australia for their chance to catch a Monster Red. We easily boast having the safest, biggest, most equipped hire boats in Melbourne …. custom built for sea conditions. Heaps of room, heaps of comfort, heaps of fishing features. We supply fishing gear as an additional feature if you don’t have your own. Boating or fishing experience is not required …. the knowledgeable and helpful Bluey’s Team are ready to assist the first timers and the veterans and we will tell you where the fish are being caught! Your DAY ON THE BAY could not be simpler. Great facilities, easy access private jetty, safe and fully equipped boats, on location bait, tackle, hire rods and refreshments, experienced mature staff … and the best recognised fishing location in Melbourne. 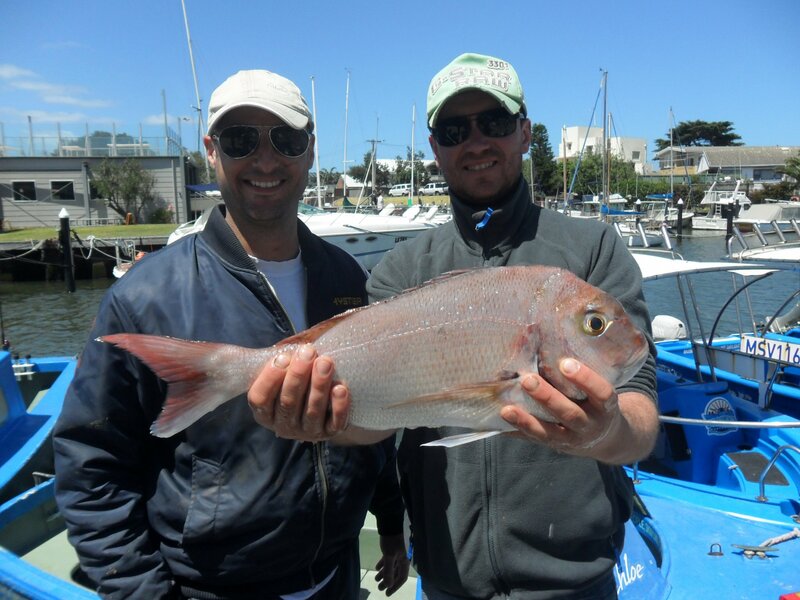 Fishing the magnificent Mordialloc Waters of Melbourne is a guaranteed great day out with mates or family. With the warmer weather, the fish biting and the best fishing spot in Melbourne, why wait any longer? Book today and get fishing! It’s easy access to our 5 secret fishing locations and the SNAPPER are on. Boat hire at Mordialloc is a real FAMILY affair with 100 years of History , we know what we are doing and can give you all the TIPS and TRICKS to have a wonderful day out. Nothing is a problem at Bluey’s , we are here to help you with all your needs . Just book online bring your drivers licence (no boat licence required)and we will do the rest. Our staff are fully trained with all things on water where you will be met by real BOATIES who can supply you with BAIT Tackle and REFRESHMENTS for your big day on the water. FUN is the name of the game and SAFETY is our MOTTO even if you have never driven a boat in your life.